While in Hyderabad, a group of students and I decided to go to Charminar and do some shopping. While walking I noticed a shop that was specifically selling elaborate hats. The hat was a turban and was decorated with many colors and jewels. I was captivated by its beauty, so I decided to purchase one. My purpose for the purchase was to wear it around for fashionable purposes, and to show my friends when I returned home. I met two guys also shopping at the store. One guy was trying on hats, while the other was helping the one with his selection. He made his selection down to two hats, and asked me my opinion on how he looked. I replied with the casual, “Oh yeah man. It looks great.” In which he replied with a stern, “No seriously how do I look? Be honest.” I, of coursed, reassured him that it looked good, so he decided to go ahead with the purchase. I later asked him where he was staying, and he replied, “In an elegant hotel near the palace.” He said he was from Hyderabad, confusing me as to why he was staying in a hotel. I was also curious as to why he was so persistent on me reassuring him of his look. I showed everyone my hat, but noticed that all the locals around me were snarking. One man even gave me a thumbs up accompanied with a large smile. I thought everyone was just being nice. However, my assistant program director approached me and said I had just purchased a wedding hat, and that it’s supposed to go along with an elaborate outfit. I felt extremely embarrassed. I had no idea of this when I purchased the hat, and of course I wasn’t getting married anytime soon. After realizing its meaning, I started to notice more stores that were focused around the outfit as a whole. The hat I bought is specifically known as a Pagadi or a Safa, and commonly goes with an outfit known as Sharvani. This is a traditional groomsmen outfit in India, and the hat can vary widely in style and color. The hat does not have to be associated with weddings. The turban is also indicative of ones social class, caste, and the region of where the wearer is from. It can also be representative of religion in the case of Sikhism. In the traditional context, the saffron in the hat stood for chivalry, while a white turban stood for mourning. https://en.wikipedia.org/wiki/Clothing_in_India. This matter of social class and valor is seen in the photos of Chowmahalla palace. It is common for royals to sport these Pagers, signifying their elegance. In western weddings, women dress up in elaborate white dresses, but in India, men also raise the bar of flash. A groom’s outfit is colored in white or beige and has many jewels assorted over the body. The torso section is made to look like a high fashioned Kurta, which is sported with long sleeves. The Kurta stretches far, taking the form of a skirt. The shirt is covered with a long coat that is closely related to the British frock coat. https://en.wikipedia.org/wiki/Sherwani . The outfit is also associated with a Dhoti. A Dhoti is a large cloth that is wrapped around the waist and is generally made out of woven silk, cotton, and wool. 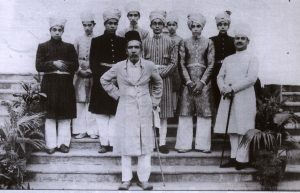 http://www.encyclopedia.com/fashion/encyclopedias-almanacs-transcripts-and-maps/dhoti-and-lungi. The groom and bride, will take part in a Mehendi ceremony, in which, a henna tattoo is applied to both feet and hands. The depth of the hennas color is directly correlated with the groom’s love for his bride. (Indian Wedding traditions). Indian weddings as a whole are extravagant. In 2011, the government pondered whether or not to restrict the number of guests that a wedding contained. This was brought to attention from the previous idea raised by the government back in the early 1960’s; however, this law did not pass. https://timesofindia.indiatimes.com/edit-page/Extravagant-Indian-weddings-unaffected-by-adverse-economic-conditions/articleshow/17378057.cms. Guests will be wearing vibrant colors and jewelry, and it is common for the groom to arrive on a white horse that is decorated head to hoove. This horse is known as a Ghodi, and, for the more affluent, can be an elephant. https://www.theknot.com/content/hindu-wedding-guest-qa. The guests will then dance around the horse to the beat of a Dhol, as the groom strolls up. After some research, I now start to see why these hats are so elegant. I also understand why it meant so much to the man who asked for reassurance. I can see now that he was trying to look his best to impress his bride, as well as, family and friends. I will now choose to wear the hat only for certain occasions, and will be on guard not to offend anyone while wearing it. The hat represents such a sacred culture that has been around since the fourth century, and it must be treated with respect.